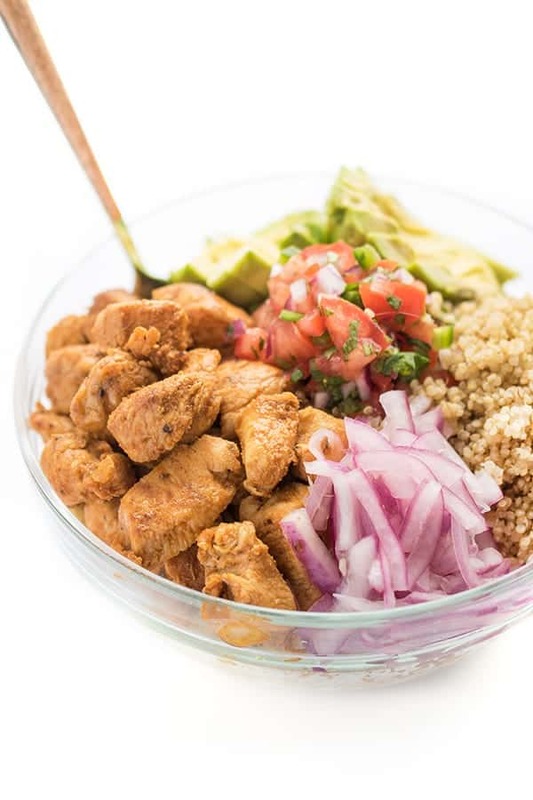 This healthy make-ahead chicken burrito bowl is filled with protein-rich quinoa, creamy avocado, pico de gallo and pickled onions. 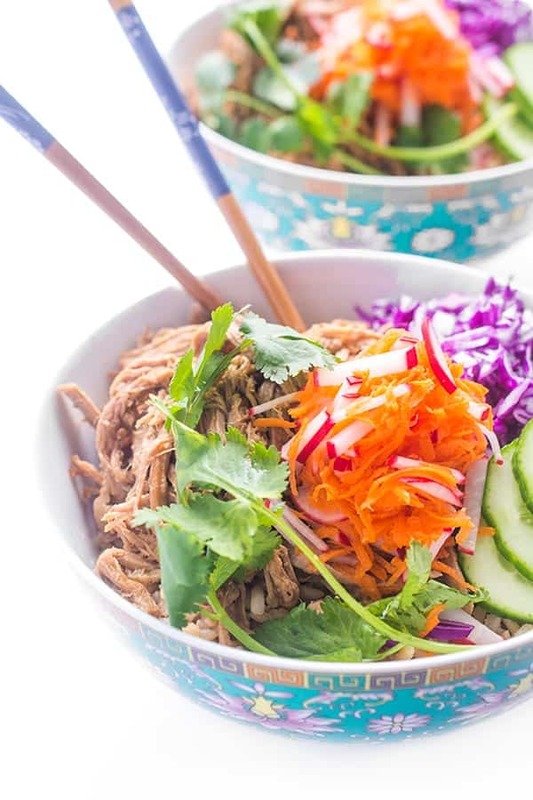 The ultimate high protein, gluten free lunch or dinner recipe. Leftovers can be a touchy subject. Some people love them while others refuse to eat them. My secret? Repurpose them! 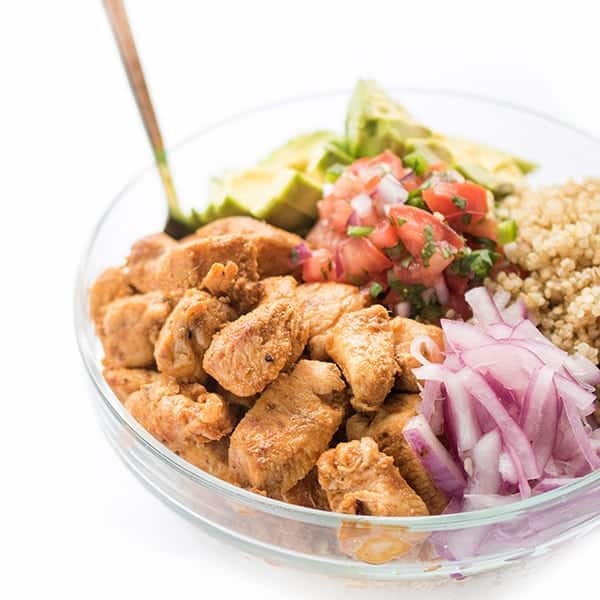 These Mexican-inspired chicken quinoa bowls came about recently when I had leftover quinoa sitting in the fridge along with several ripe avocados that weren’t going to make it very long. For added protein, I seasoned chicken breasts cubes with cumin, smoked paprika, garlic powder and cayenne before sautéing it until golden brown in a little olive oil. 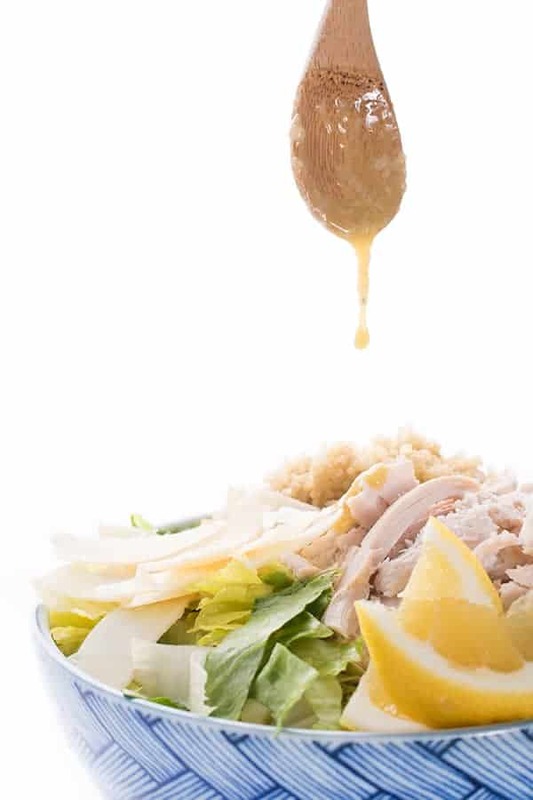 If you’re stretched for time, shredded rotisserie chicken works like a charm. 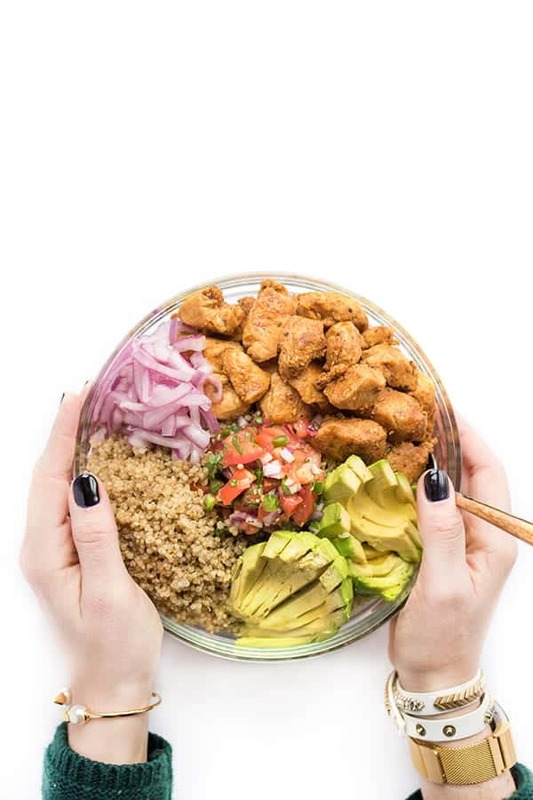 For a boost of freshness and a little welcomed acidity to balance the creamy avocado, I top each bowl with a big scoop of pico de gallo and a couple tablespoons of pickled onions. The end result? 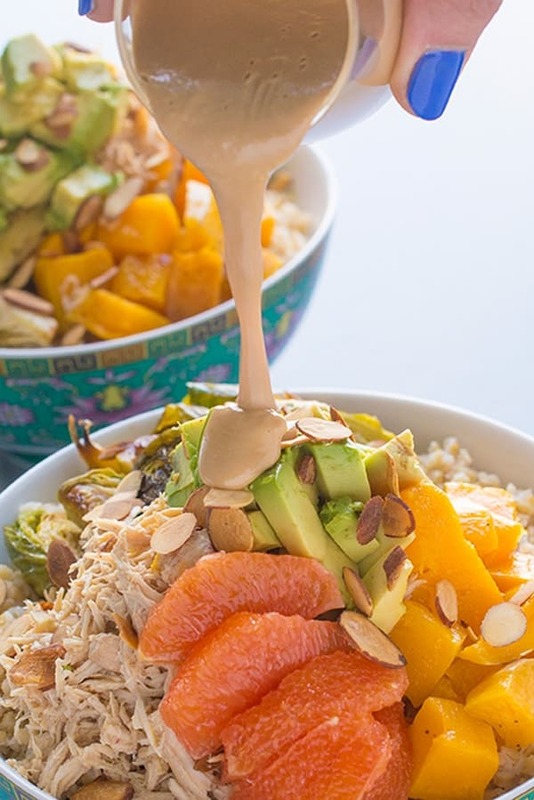 A perfectly balanced, nutrient-dense, flavor packed meal in a bowl. 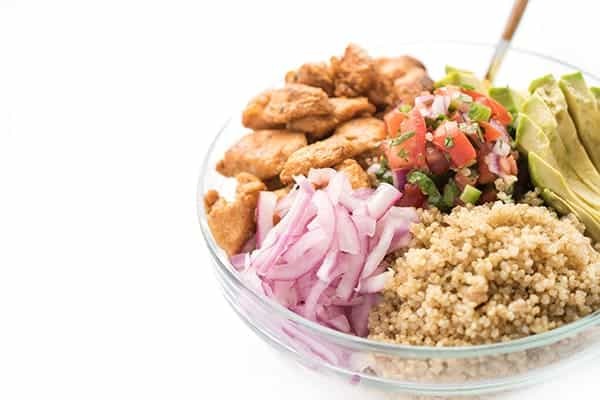 This healthy make-ahead chicken burrito bowl is filled with protein-rich quinoa, avocado, pico de gallo and pickled onions. The ultimate high protein, gluten free lunch or dinner recipe. To prepare the pickled onions, place onions, lime juice and salt in a bowl and toss well. Let sit for 15 minutes or longer; set aside until you're ready to assemble bowls. Meanwhile, place the chicken cubes in a medium bowl and season with all of the spices (cumin through cayenne.) Toss well to coat evenly. Heat olive oil in a large sauté pan over medium-high heat. Add chicken and sauté until cooked through and slightly browned, about 7-9 minutes; set aside until you're ready to assemble bowls. 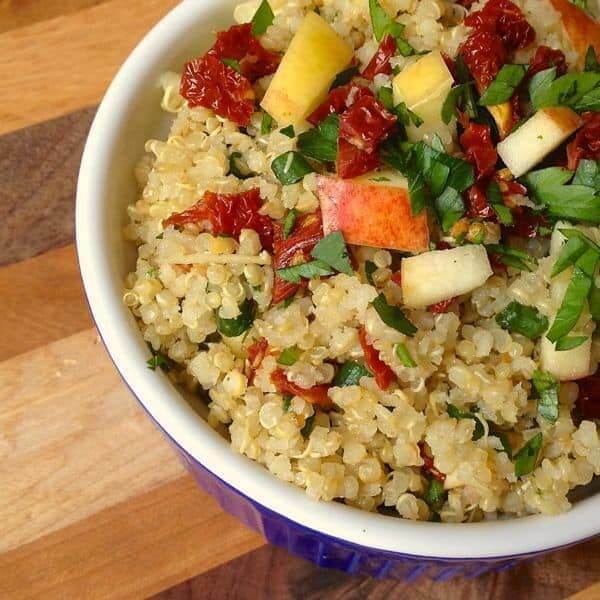 To assemble bowls, divide cooked quinoa evenly between four dishes. Top with equal parts of the sautéd chicken, avocado slices, pico de gallo and pickled onions. Serve warm, room temperature or chilled. Can be prepared up to 3 days in advance. 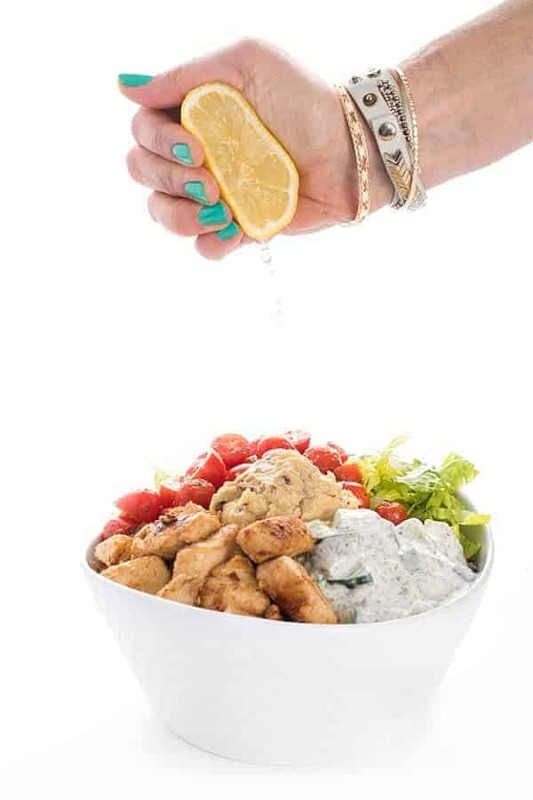 Check out my Pinterest board for more recipe ideas! love the seasoning for the chicken! this looks delicious! will have to try ASAP! Looks like the perfect weeknight meal! Thanks for the recipe. I hope you love it Kevin! Looks delicious and healthy, kids are home for march break, i will make it for them tomorrow , i’m sure they will love it, Thanks!